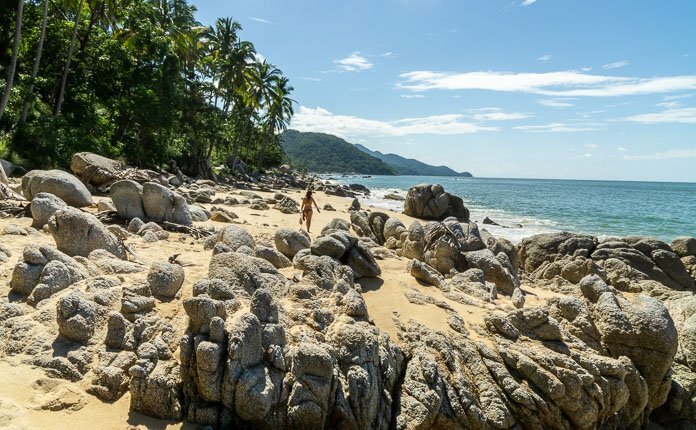 The hike from Boca de Tomatlan to Playa Las Animas is a mixture of coastal jungle and secluded sandy beaches. 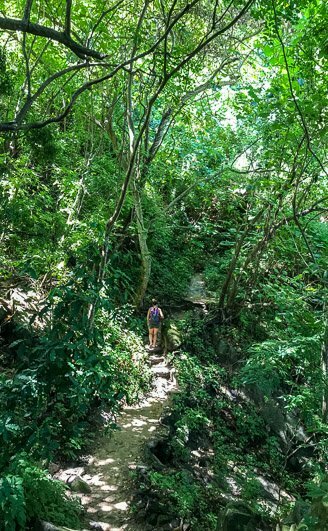 This hike takes you away from Puerto Vallarta for a perfect day of hiking, sunshine and swimming. Without stopping the hike itself takes around 2 hours to complete. It is a mixture of cobbled paths and jungle trails. Even though it is not a long hike, roughly 2.5 miles, you should still plan for a full day, because what’s the point of hiking to multiple secluded beaches if you don’t take the time to enjoy them? There are two ways to get to Boca de Tomatlan from Puerto Vallarta. The first, and more expensive option, would be to take the water taxi from the Los Muertos Pier. Or you can take the local bus from the corner of Basilio Badillo and Calle Constituction. Located just past Nacho Daddy, in front of the OXXO. 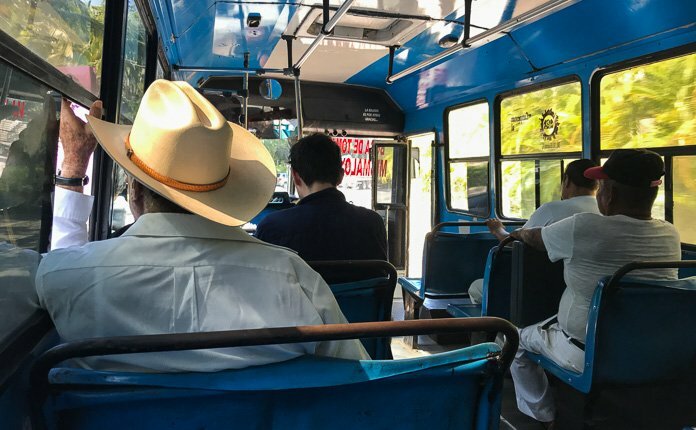 The bus is orange and white, it will cost you 8 pesos and takes around 20-30 minutes. 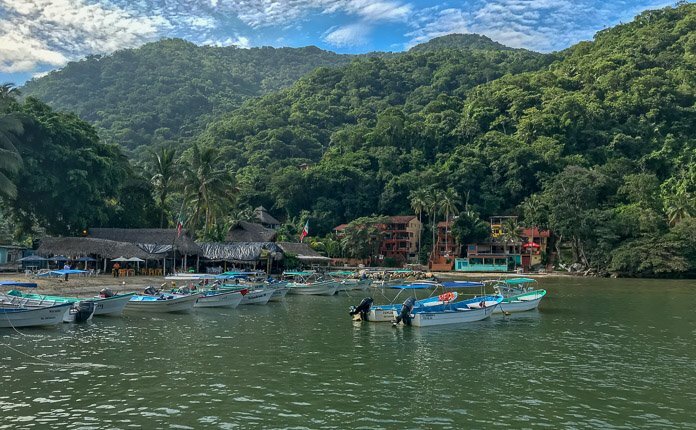 Not only will taking the bus to Boca de Tomatlan save you money, you still have the option to take the boat back to Puerto Vallarta from Playa Las Animas. 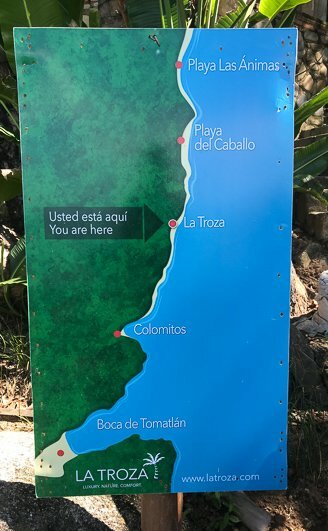 This is a nice option if you decide that you would rather not to hike all the way back to Boca de Tomatlan. 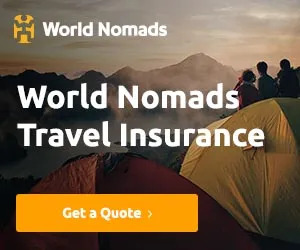 Mostly you only need the essentials, sunscreen, snacks, sarong and water. You can get food and snacks in Boca de Tomatlan. At the end, Playa Las Animas, has restaurants and food stands, so you don’t have to worry about packing lunch. I did the hike in shoes and my girlfriend did it in sandals. 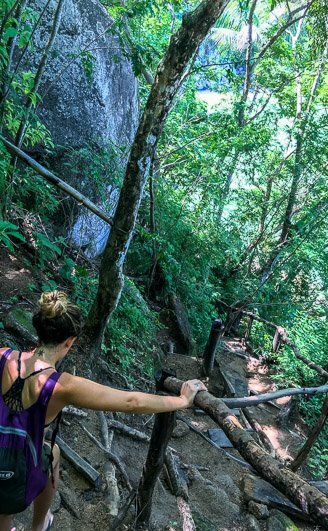 Shoes are not absolutely necessary, if you are used to and comfortable enough walking in sandals, there are only a couple parts of the hike that you might need real shoes, its mostly personal preference. 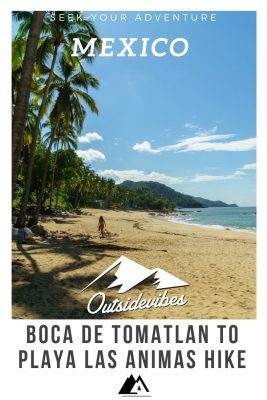 Starting with Boca de Tomatlan there are 5 or so beaches that you pass before arriving to Playa Las Animas. 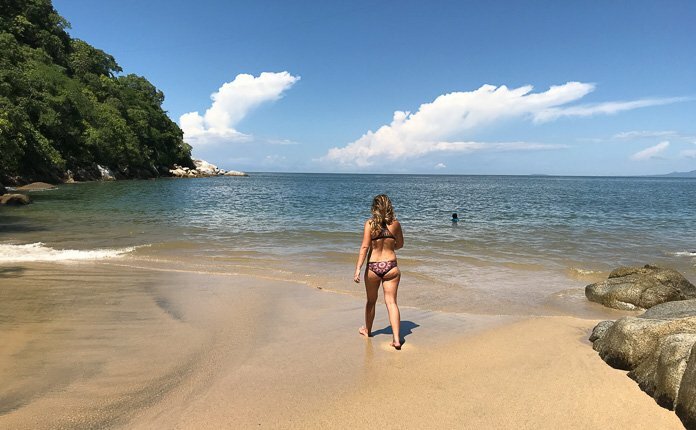 As you make your way to Playa Las Animas the beaches get progressively larger and nicer. Colomitos Cove is the first and most popular beach, due to its closeness to Boca. A lot of people walk to here and then stop. Unfortunately Colomitos Cove is small and if you stop the hike here you will miss out on way nicer beaches. The next beach is slightly bigger than Colomitos. It has some nice shade and it is secluded, making it a good spot to stop, swim, and rest for a while. From here the beaches get larger and are more built up with bungalows and resorts dotted along. 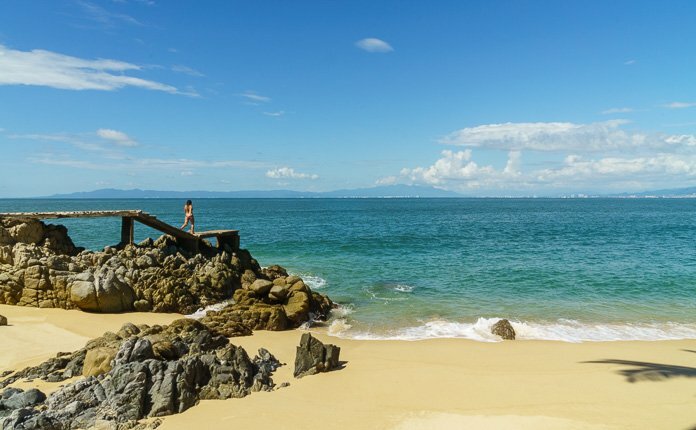 Playa Los Animas is the most developed of all the beaches. 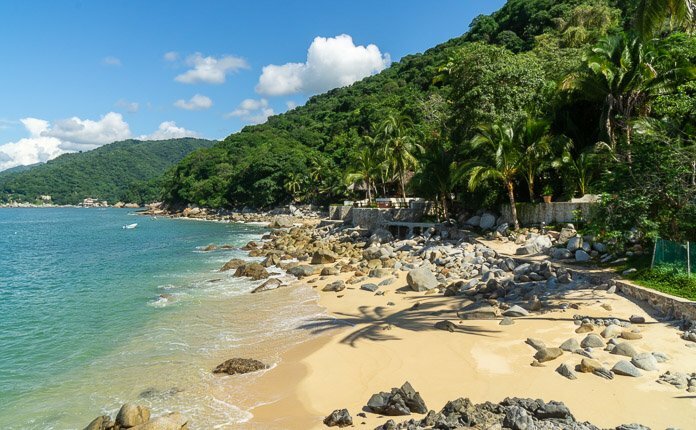 It is also the most popular, due to the boats that come strait from Boca and Puerto Vallarta. Starting out at Boca de Tomatlan’s bus stop, you walk strait down the road towards town and the ocean. Along this road you will be bombarded by guys asking if you need a boat ride, which you can take if you don’t want to hike, but for those of you that are hiking that is all you need to say and they will let you be. When you get to the end of the road on the right hand side is the beach, boats and ocean. On the left is where you turn to continue walking. You walk along this road until you come to the concrete pedestrian bridge, that you cross to start the main trail. The bridge is located past a parking lot on Calle la Cascada and there will be signs for the La Posada Pacifica hotel. Wild Tip: If the water level is low enough you can walk across the Boca beach to the other side of the bay cutting off the part of the trail that goes to the pedestrian bridge. Once you are across the bridge you follow the path towards your right. This path weaves through houses and follows the coast around to the point of the bay. Just keep to the coast and you will be fine. If you need help ask for Colomitos Cove. The stretch from Boca to Colomitos Cove takes about an hour. Once you get past the first point, through all of the houses, the trail opens up to the jungle. This leg is also the hardest part, with the most up’s and down’s. 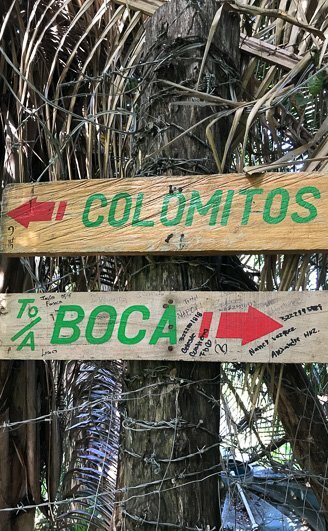 On the actual jungle path you will find signs marking how far you have gone and what the next beach is. At Colomitos Cove the trail picks back up on the opposite side of the beach via high concrete steps. 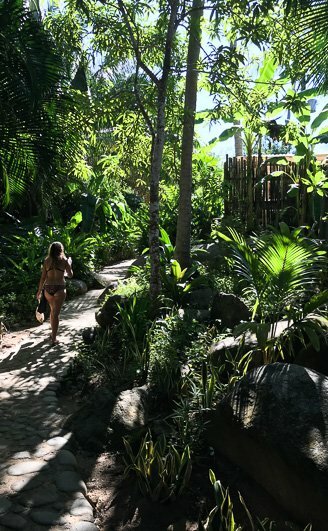 After heading up the steps you then pass through the jungle for a few minutes until you arrive at Playa Escondida. This beach is very secluded, shaded, and my favorite of the hike. 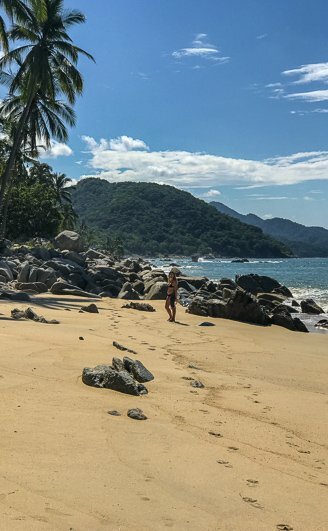 Once you get past Playa Escondida you are done with the hardest parts of the hike and onto the final jungle stretch leading to Playa las Animas. 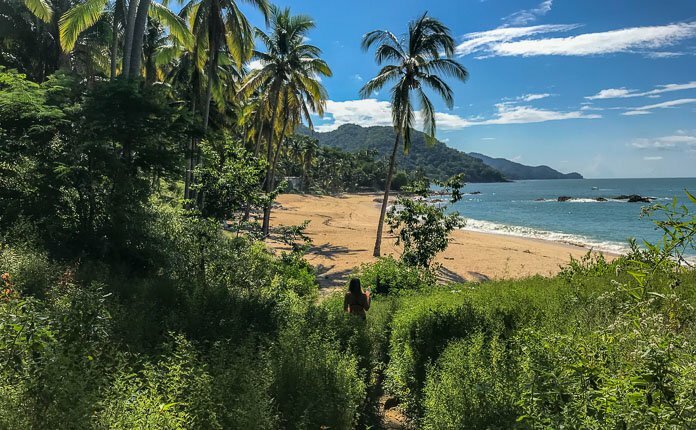 Upon finishing this short jungle section you will start walking across stunning beaches and bungalow filled resorts until you reach Playa los Animas. I wanted to title this post Hungover Hike because that is what this was for my girlfriend and I. We may have went out the night before the hike and enjoyed a few too many 16 peso margaritas. I am always the early riser, even with that, but Emma is not. So I was surprised that I got her up, breakfast done and a few errands ran, before we caught the 10am bus to Boca de Tomatlan. I had been looking forward to completing this hike since my mother and I attempted it 6 months prior, but we never made it past Colomitos Cove. By the time Emma and I got to Boca Emma’s energy was quickly turning. The next few hours were full of struggle and sickness as we crept along this beautiful jungle coast, only looking forward to the next beach to sit and rest. 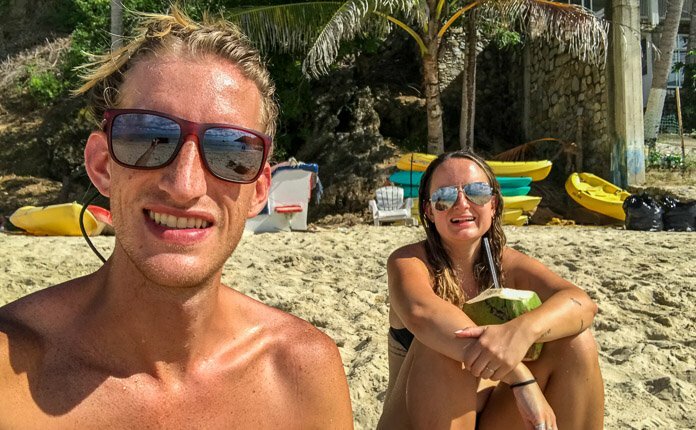 We spent way too much time at the beach just past Colomitos Cove, even though it was desperately needed. By the time we got further along and saw how stunning these later beaches were, we had no energy or ambition to truly enjoy them. The only thing on our mind was to make it to Los Animas so we could be done. We arrived to Los Animas with just enough time to enjoy a fresh coconut and short swim before catching last boat of the day back to Boca. There were no more directly to Puerto Vallarta otherwise we would have gladly paid the extra to do that. Just so we could get back to our hotel earlier for a bed and food. Finished, can we go home yet? 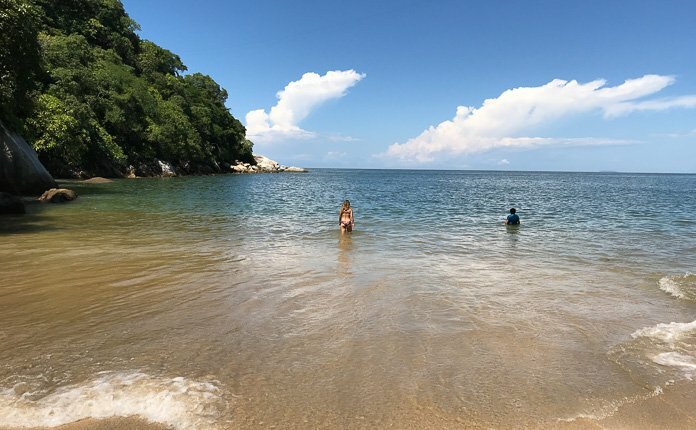 I am a sucker for any hike but the hike from Boca de Tomatlan to Playa los Animas hungover was not what I had in mind. The hike took us way longer than planned, we had a few unexpected pit stops and not as much beach time. Even hungover the beaches are stunning and the hike itself is nice and chill. Anyway fresh air always makes my head feel better. 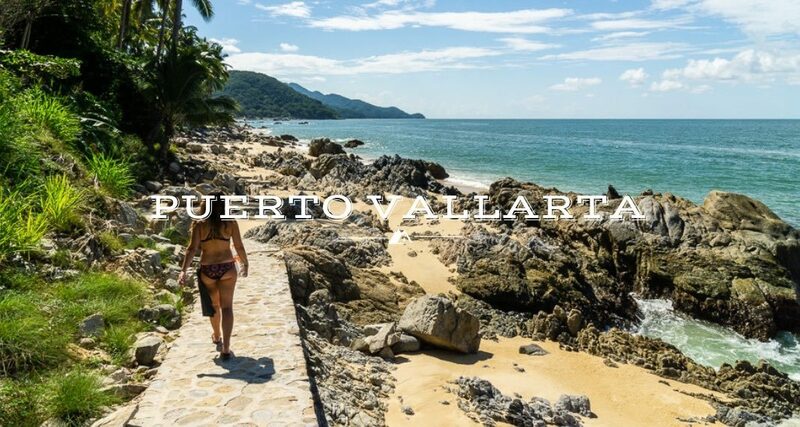 For other great activities around Puerto Vallarta check out my budget post for the city or visit the Destination Mexico page to learn more about this area of Mexico.